From what I have seen, a common workflow is to get the styles looking right in a style inspector and then select and copy that rule out into an editor. Currently, that is not possible with our rules view. What users expect from other tools (Firebug, Chrome) is that they can select and copy the rule. It would be a nice bonus if they could copy a rule or individual property/value from the context menu. I have implemented a simple copy (ctrl + c) and context menu copy. Once I have added "copy property" and "copy rule" I will attach the patch. It is expected that in the rule view dragging the mouse to select text is going to be difficult because focusing a node opens a property editor ... nevertheless, it is working fairly well. 1. Click and drag to select text, ctrl+c or context menu to copy (rule & computed views). 2. Context menu copy rule (rule view). 3. Context menu copy property (rule view). Attachment #602928 - Flags: review? × In "Copy Rule", a "\n" should be inserted before the last bracket. × Is it possible to not include the "file:line" reference when we select text in the Rule View? This is a first pass. This patch looks a little more complicated that I expected, but it's totally justified. I am happy with the global approach. Here are some comments about the code and the general feature (see comment 4 as well). The Computed View menu should have more items: "copy value", "copy property name", "copy declaration line". The cursor in the Computed View should be a text cursor, and clicking a line should not expand it. Only clicking on the twisty should expand the declaration. - copy of the different parts of the declarations, make sure the reformating works well. Can you explain in a comment why you do here? createElement() doesn't work? It's a XUL document. So we use the DOS format on Windows. Is that recommended? What do other editor do? I am not sure to understand what's happening here. Can you add a couple of comments? Do you need to use createElementNS? Why not just createElement? Can we get a comment about what you're doing here? s/"Copy"/"Copy selection" (when it's disabled because there's no selection, it's a little confusing). > × In "Copy Rule", a "\n" should be inserted before the last bracket. Are you saying that you want an extra blank line before the closing brace? If you are then I disagree. If you get something different than what I get (worried look), then please let me know what you are getting. > text in the Rule View? > expected, but it's totally justified. I am happy with the global approach. > name", "copy declaration line". I can add "Copy property", "Copy property name" & "Copy property value" but I am unsure what you mean by "copy declaration line". I think that the only ones that make sense for the computed view are these ones. /me has always wanted it that way ... done. I have added a bunch of tests. > Can you explain in a comment what you do here? > createElement() doesn't work? It's a XUL document. 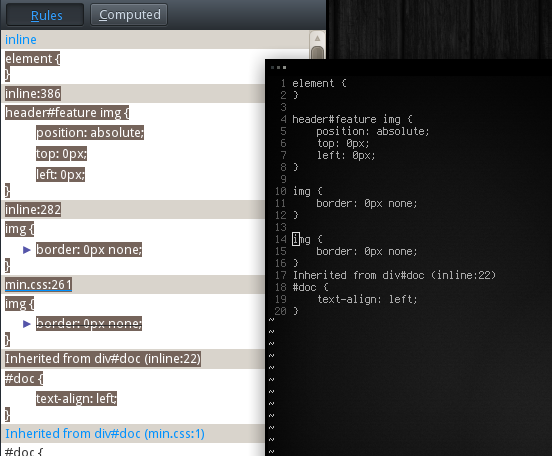 Most use UA sniffing (even in the fx codebase), Orion checks current line endings and falls back to UA sniffing. All of them use \r\n for windows boxes and \n otherwise. In my opinion getting nsIXULRuntime.OS to identify the OS makes a heckuvalot more sense. I have rewritten ruleViewCopyProperty to make it a little more robust so this code is no longer needed. > Do you need to use createElementNS? Why not just createElement? > Can we get a comment about what you're doing here? > > +# copy entry. > it's a little confusing). The computed view had no in-content stylesheet until bug 705276 is fixed (Split style inspector CSS between content & document CSS) ... I have upped it's priority to P2. > > × In "Copy Rule", a "\n" should be inserted before the last bracket. > Are you saying that you want an extra blank line before the closing brace? > (worried look), then please let me know what you are getting. > > text in the Rule View? > Of course ... done. I think you should just make the source not selectable in CSS (using -moz-user-select) (I am not 100% sure about this). ctrl-a + ctrl-c copies should copy a formatted version of the CSS (right now, it's one single line with the file reference. > > name", "copy declaration line". > ones that make sense for the computed view are these ones. declaration == property + property value. As this is not a commonly known term, I think adding "line" at the end makes it a little more understandable. > /me has always wanted it that way ... done. Can you also make sure the right element is focused then? > it's priority to P2. > > > × In "Copy Rule", a "\n" should be inserted before the last bracket. > > Are you saying that you want an extra blank line before the closing brace? > > (worried look), then please let me know what you are getting. Interesting that it copied without whitespace before the } ... I have changed the regex to cover this if it happens again. > > > text in the Rule View? > > Of course ... done. > -moz-user-select) (I am not 100% sure about this). Unfortunately, doing it that way means that you can't drag the mouse across the text if you start from one of these headers. In fact, setting moz-user-select: none made selection really hard to use. We just need to use regexes for this kind of thing. > now, it's one single line with the file reference. > > > name", "copy declaration line". > > ones that make sense for the computed view are these ones. > declaration == property + property value. > it a little more understandable. It is an official term so I don't think we should shy away from using it. Copy declaration is fine. > > /me has always wanted it that way ... done. > Can you also make sure the right element is focused then? Don' block this bug with bug 705276. Consider bug 705276 as a follow-up bug (I don't want to risk to miss this bug for the merge). Looks good. r- because of some nits and the behavior issues. I haven't read the tests yet. Mousedown then drag from a property value will start the edit-mode. We should prevent that. Selecting a range, then click on a value start the edit-mode. We should just un-select the range. Second, what not using on single handleEvent listener (we do that for IUI and the breadcrumbs)? > +    // Copy Selected. > +    // Remove any double blank lines. These 3 latest regexp seem a little fragile. Do we test that in the tests? > +   * Copy a property from the rule view. Overwrite the existing methods. Don't create new ones. > +    // the same line and inserting a colon between them. Can you use the text content of the 2 surrounding nodes and concat them instead? Do we remove this listener somewhere? That might be difficult with the current code. I think we should worry about that as a followup, there's still value in this patch if we can't fix that today. We've been asked by browser reviewers to use this pattern during superreviews, but CssRuleView does it the way paul is suggesting. Let's go for file consistency for now (in CssRuleView use foo = foo.bind(), I don't know the file style for CssHtmlTree). CssRuleView at least, tends toward handler-per-event. Mike can use his judgement on that one. > Looks good. r- because of some nits and the behavior issues. > I haven't read the tests yet. The original dev used onFocus to trigger the property editors, which seemed like a good idea at the time. This meant that clicking them with a mouse or tabbing to them would trigger the editors. It also meant that he could easily auto focus the next element to get the editor behavior that he wanted. Changing this is a bigger job than we need right now so I have logged bug 734365 for this. Agreed, but we can't change this until bug 734365 is fixed. We will leave this (as discussed on IRC). Because most of the events I am adding are command listeners. If event.type == "command" for 5 out of 6 of the events then things would get ugly. Beside, Dave said that I can use my judgement on this one. > > +    // Copy Selected. > > +    // Remove any double blank lines. It does for almost every line. I have corrected the comment to "// Remove any double newlines" as it wasn't quite correct. > These 3 latest regexp seem a little fragile. Do we test that in the tests? > > +   * Copy a property from the rule view. > Overwrite the existing methods. Don't create new ones. As discussed on irc, we will leave them as they are. > > +    // the same line and inserting a colon between them. > Do we test that? > > +        // string. > Do we remove this listener somewhere? Not directly. The computed view's event listeners don't leak at all because the document is destroyed by the destroy() method where we remove all listeners that are attached to XUL elements. In fact, most of the computed views listeners are added by DOM Templater so we can't remove them. There are no leaks though, I have already checked that. > > should prevent that. > > un-select the range. > know the file style for CssHtmlTree). > > and the breadcrumbs)? > judgement on that one. I need to fix browser/browser/devtools/styleinspector/test/browser_ruleview_focus.js because of oranges before we land this. Fixed issue with rule view focus test and windows clipboard differences. Now all green on try. l10n doubt: why do you need two sets of identical strings (e.g. style.contextmenu.copyselection and rule.contextmenu.copyselection)? I'm trying to think of a reason but I don't find any (this strings don't refer to names, so there's no problem with gender, plurals, etc.). > l10n doubt: why do you need two sets of identical strings (e.g. > refer to names, so there's no problem with gender, plurals, etc.). The 2 strings are for 2 completely different tools. I suppose it would solve a lot of confusion if we split the strings into 2 different files but the one file should be okay for now. And listed on Firefox 13 for developers. Result: nothing happens. When I right click, the option "copy selection" is disabled. Why is this? You need to drag over text to select it. It would be possible to get copy working in property editors within the rule view. If you create a new bug and CC me I can do that.